The Monarch (Danaus plexippus) is one of the most widely recognised of all butterfly species. It is also one of the most interesting, with some individuals migrating thousands of miles, but unfortunately it is under threat. The migration route covers Mexico, the United States and some individuals make it as far as Canada. The threat comes across this region. The caterpillar feeds on the various (100+) species of Milkweed in the US. Unfortunately much of the grassland is now agricultural, and the use of herbicides has had a large impact on the amount of Milkweed, as well as other flowers that provide nectar for the adults. Here in the UK there has been a considerable amount of pressure from various organisations as well as professional and amateur naturalists to promote the idea of leaving the margins around fields to grow wild - and a similar scheme in the US would be very likely to have a positive impact on this and many other species. The butterflies roost in high mountain forests in Mexico, and these too are under threat. The actual regions they roost in are officially protected by law, but a complex legal and land ownership system means that rogue logging operations cans till occur in these supposedly safe areas. Thinning of the canopy causes a greater temperature fluctuation at night, and as a consequence many may freeze to death. 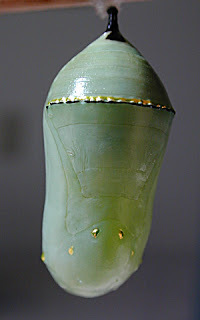 The Monarch gets its name from the 'crown' that is visible on the pupa. Today I went to a lecture at the Natural History Museum, London by Professor Lincoln P. Brower - who has done much to help the conservation of this species. 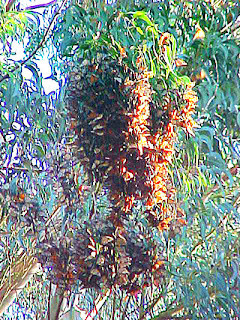 This article is based on his talk Conservation Issues and Survival of the Migration of the Monarch Butterfly.